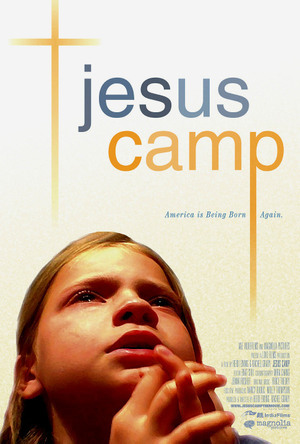 Along with a group of Christian friends, I just sat through the controversial documentary Jesus Camp . The movie profiles a fundamentalist group of Pentecostal Christians on their quest to "teach" the next generation what it means to follow Christ into "battle." The children in this film, all appearing to be under the age of twelve, are ushered from their kitchen table home schools and their charismatic Sunday school classrooms to a summer camp in North Dakota. There they learn about Jesus as Lord, His death and resurrection, the salvation of mankind... all things I believe, too. But the intense speakers, the comparison to preparation for war, the graphic visual aides... all of these smack of something different, something cult-like. The tear streaked faces of guilt-ridden seven-year-olds filled the screen as each of the children dropped to his or her knees and asked for forgiveness, accepted the cleansing of water splashed upon them from a Nestle water bottle brandished by the "minister." When this movie was released in 2006, the trailer was all I needed to remind me (and, I hoped, my fellow Christians) about the power of negative imagery involving the church and about our responsibility as Christians to portray the positive, loving side of our faith all the more to counteract such obvious exceptions to the rule. But now having viewed the movie in it's entirety, I am struck by something else. This camp is not so very different from the camps I attended as a young person. At thirteen and fourteen and fifteen and sixteen, I was a willing participant in rallies and camps put on by churches and other Christian organizations. In a stadium or amphitheater or gym or auditorium or sanctuary with dozens or hundreds or thousands of my peers... my hands waved in the prayer-filled air to the strains of glittery modern gospel rock; my eyes were closed; my lips were moving; I felt Him in that place with me. He was sweating along side of me. My t-shirt sleeves were rolled up and the dew of excitement and exertion was shining on my shoulders. I called out to Him, offered an Amen to punctuate the truths being called to us by an exuberant speaker with a quick wit, a crew cut, and a microphone. I was reminded of my sins and reminded of my redemption. It was powerful. So, yes, I was carried away. By what? Peer pressure? Adrenaline? Jesus? When the stories about Cassie Bernal came out in the terrifying wake of Columbine, she became Martyr #1 for my generation. We knew her name and we sang her praise and we prayed that each of us would be as brave, as honest, as willing if faced with the same horrible choice. Denounce Christ or die. Suddenly, we knew that something so dire could happen to us, even protected by blackboards and teachers and sock hops, it was a possibility. So, yes, I've considered martyrdom. Yes, I've heard an accurate Christian walk compared with a battle. Prayer and wisdom and truth are the shield, the helmet, the sword. I wore the t-shirts that appeared to be easily recognizable logos of modern day pop culture but actually included a Christian reference. The bright orange shirt sported by young Levi the child preacher in Jesus Camp looks like a Reeses Peanut Butter Cup label... but it actually says Jesus in the yellow script. I owned that shirt. Wore it to Mexico on a mission trip; wore it to Spirit West Coast/Acquire the Fire/Festival of Praise/Any Other Big Christian Event. So, yes, I've allowed my faith to affect everything down to my wardrobe choices, music library (DC Talk, Audio Adrenaline, Newsboys), even the backpack I carried for years which had scriptures written in graceful puff paint from top to bottom. That backpack was the catalyst of my being physically assaulted on my high school campus as a freshman. It was also the reason I was approached multiple times by classmates who had legitimate questions about God and faith. I worry about any Christian who sees this movie and scoffs, "Oh, that's just awful. They've got it all wrong. Thank God our church has it down right." Because the truth is that not one of us has it "right." Christ was crucified . For Him, it was all or nothing, and He calls us to that, too. Granted, we all fall short, but that's my point. Becky Fischer, the woman who ran the camp and was profiled in the film, thinks she is following God. Seeing her "preach" to children until they are in tears and 'fessing up for all the bad stuff in their heads makes me ill. I doubt I'd put my child in that arena. But while I might be able to sit here, a couple thousand miles away from little blond Tory, a ten-year-old who stresses about making sure her dancing is for God and not "for the flesh," and postulate that she would be better off in an after school program teaching athleticism or world view or working in a soup kitchen... the flip side of that coin is realizing the long list of worse places she could be. Abandoned, left to her own devices, left to the exploitation of someone else who doesn't want her to be a productive member of anything... but looks on her as property or a plaything or... Yeah, I'd rather Tory spends her summers making friendship bracelets with Pastor Becky. And as for Pastor Becky... my knee jerk reaction is that this camp, her entire ministry, is the result of her reaction to the same void we all feel or have felt at one time or another. She wants to serve a purpose. She's defined the "greater good" and is going out to make sure the world achieves it. Children are her conduit. I don't blame her. If she harms the children, I blame the parents who sent them there, again being humble enough to remember that Ms. Fischer is definitely the lesser of many evils once a comparison is drawn. I admire Pastor Becky for having the courage and determination and faith to try to run a ministry in the name of God. I pity her for erring on the side of brimstone. I hope she's not entirely wrong. My church is a good church as churches go. But kids cry at rallies when their emotions are stoked by the intensity of the Christian message. It's a big deal; it's worth some tears. So is the fact of sin being equated to death and damnation for eternity. It's so big and so scary that modern, loving Christians would rather gloss over it in favor of more popular trends like tolerance and love outweighing all else. Unfortunately, Biblically speaking, you can't have one of those Truths without the others.... even if it's impossibly inconvenient. And as long as we insist on sharing these deep, deep facts with children, something which we're called by God to do, we'll be at risk of accusal as indoctrinators or worse. What does that prove? Who does that hurt? I want each of us to come to Christ of our own free will... and that's what we are supposed to do, Biblically. Each of the kids in the documentary will eventually make that choice, too. Whether they've done it already isn't for us to say. In fact, not one of you can say definitively whether my claim as a Christian is founded. Sometimes, I can't even make that call about myself. I do not defend Jesus Camp as a documentary (Nominated for an Oscar? Are they kidding?) When you pull back the Kinkadian veneer, the film is tripe. It attempts to shine a light on some great right wing conspiracy, the indoctrination of a generation of Bible Belt pre-adolescents. But really, it's a look at a small, sheltered slice of middle America, the smallest of slices. And it should be treated that way.